Stoneware mixing bowls. You will love these Stoneware mixing bowls - easy to clean, easy to use, nice looking. Each stoneware bowl is a unique creation by talented artisans from Boleslawiec, Poland. Heavy in weight, these Polish ceramic bowls stay put on the counter, and are great for mixing doughs that require some elbow grease or as serving bowls for salads and side dishes. No matter what the occasion, quality handmade pottery is a gift that's sure to be treasured for years to come. Stoneware mixing bowls: Old fashioned mixing bowl is a deep bowl that is well suited for mixing ingredients together. 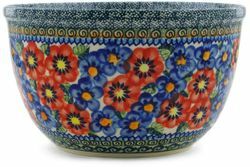 Mixing bowls come in many materials; on our site you will find beautiful handmade pottery mixing bowls. If using a handheld electric mixer, be sure to get mixing bowls that will be usable with such a mixer, and which have high enough sides to prevent splatter from it. We will suggest to have at least three stoneware mixing bowls of different sizes, as it is often necessary when baking to keep mixtures of ingredients separate. Also, prepared dough can be stored in the refrigerator directly in the Polish pottery mixing bowl.